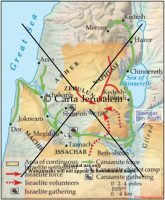 In the tribe of Benjamin, a hero named Ehud son of Gera delivered his people from Transjordanian aggression (Judg 3:12–30). The Book of Judges was intended to give due credit to the various tribal heroes of the pre-monarchial age. On the other hand, the book stressed the shortcomings of even the most renowned of the judges, or deliverers. 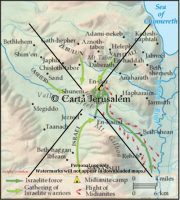 The Bible records two major conflicts between the Israelite tribes and the Canaanites of the cities in Galilee: the battle of the waters of Merom (Josh 11:1–15) and the battle of Deborah (Judg 4 and 5). 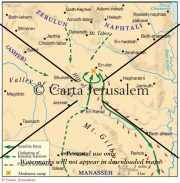 In both accounts, the leader of the Canaanite league is Jabin, king of Hazor. Three chapters in the Book of Judges (6–8) are devoted to the career of a hero – Gideon – from the central hills of Ephraim, from the clan of Abiezer, a branch of the tribe of Manasseh. Attention is focused on Transjordan with the legend of Jephthah (Judg 10:6–12:7), a hero whose life reflects a number of themes from this type of literature, not only in the Levant but in the eastern Mediterranean in general.